We travelled to the James Bay coast to deliver one of our workshops for the Moose Cree First Nation; it was a fantastic experience and we had the pleasure of educating 10 students on the design and installation of Solar powered systems. We are looking forward to our continued involvement in the education and assistance with the Moose Cree community. The Independent Electrical System Operator of Ontario has done it again, the microFit rates have been adjusted, and they are not going up. The changes from 2016 to 2017 are very minor as the chart below shows. The largest reductions are for larger projects as an 8% reduction will somewhat affect the utility scale projects. It is no secret that the IESO is slowly pulling back on the microFit program and that is the way it should be. The solar industry in Ontario can only be propped up for so long until it needs to succeed on its own. 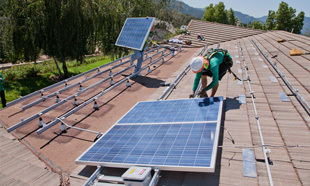 As utility power continues to increase Net Metering is making more and more sense. When the return on investment(ROI) for Net Metering projects reaches 7-9 years as it did with the microFit program it will supplant the need for the Ontario government to subsidize the industry and let it stand on its own merits and economic benefits. Hopefully the transition is seamless and the industry can make the shift from relying on subsidized government programs to just being a sound business model.